Rebel of the Sands is awesome. It is such a captivating read that I was having a hard time putting the book down. And when I finished it I wanted more. OOoh nice haul!! I adored Night Study but I'm pretty much a forever fan of Maria's!!! Rebel of the Sands is one I am only recently seeing but I am already intrigued and onto the Wishlist it goes!! Hope you enjoy all the reads! Did you know you can get Collectible Cards from Eloisa James? I am sending for them tomorrow!! Wow, good haul! I've made a sort of decision to not buy new books as there are so many already out books that I can access (my parents, the library, some books I've bought but haven't read yet...). The reason it's a 'sort of' decision is because sometimes it's just too hard not to buy new books! New releases! Ah, these all look so good. So, how do you think I can justify this...? I loved Night Study. Hope you enjoy it! Rebel of the Sands sounds good as to several others. Enjoy all of your good Haul! Nice haul! 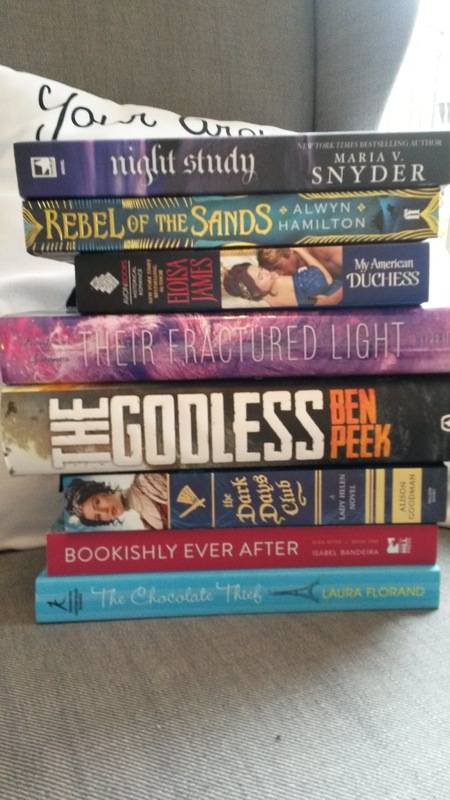 I know a lot of people have been reading and loving Rebel of Sands, which is why that one is also on my TBR. The other books look great too!